FUNDING FOR NEW FRUITMARKET PRODUCTIONS OF VIVIANE BLUMENSCHEIN, DAVID BERNET, FLORIAN OPITZ, MILO RAU, ENRIQUE SANCHEZ LÁNSCH AND HEIDI SPECOGNA IN GERMANY, NORWAY AND SWITZERLAND! We are pleased about the positive funding decisions of our projects. With the funding approval of the Norwegian Film Institute (NFI) for our Co-producers of UpNorth and the documentary "POL POT DANCING", Enrique Sánchez Lansch's new film can go into production this year. Shooting of Milo Rau's "THE NEW GOSPEL" will begin this summer. ZDF and ARTE had already approved the project as a „Grand Format“. With the support of the Film- und Medienstiftung NRW and the Zürcher Filmstiftung the project is almost completely financed. We are looking forward to the renewed collaboration with Olivier Zobrist and Langfilm AG in Zurich. The Zurich Film Foundation also supported our Co-producer Peter Spörri (PS Film Zürich) for our joint project "CLAUDIA ANDUJAR - EINE BEGEGNUNG MIT MISS YANOMAMI". The shooting of the new film, by the award-winning director Hedi Specogna, will begin in autumn. We are especially pleased about the funding for our documentary series. The Medien Board Berlin Brandenburg supported the production of „CAPITAL B“, a series by Florian Opitz and David Bernet, which we are coproducing together with Port-Au-Prince Film. And our partners Benjamin Seikel and B14 Film were supported by the Filmförderung Hamburg Schleswig-Holstein for the development of the project "WE CALL BS". Fruitmarket contributes 50% of the development. to the development. Director Viviane Blumenschein and Co-author Arne Birkenstock are now starting the work on the script. At the beginning of June, the shooting of Uli Gaulke's new film "CENTURY OF WOMEN" will also begin in Cuba. We will complete the development phase of Philipp Jedickes' "VIENNA CALLING" (a Co-production with Amour Fou) and start producing two major international series in autumn 2019. Our documentary “SUNSET OVER MULLHOLLAND DRIVE” by Uli Gaulke will celebrate its International Premiere at the annual Film Festival South by Southwest in Austin this coming march! The film tells stories of a one-of-a-kind place in Hollywood: The Motion Picture & Television Country House, where former actors, directors and even big studio bosses spend their retirement days. We are happy to receive support from the Film- and Medienstiftung NRW for our film „An Open Attempt“, directed by Sebastian Lemke and Arne Birkenstock. The documentary draws the visual topography of the art space Hombroich as it were an intimate portrait of artistic work, thoughts and coexistence. The founder of the museum and the foundation Karl Heinrich Müller, wanted to create a utopian Eden amidst the beet fields of the lower Rhineland. The lifework of a passionate visionary, where art, architecture and nature become one. But the idea behind Hombroich was bigger: a revolutionary social experiment should bring together artists from a wide variety of disciplines, to dedicate their time radically and freely to art. In late November “THE CONGO TRIBUNAL” will premiere on television. “Mamacita”will be part of the 35th Kasseler Dokfest and has been selected for the section “DokfestGeneration”. This section presents documentaries which portray life of generations in different ways, following the principle of “film has no age”. Together with PS Films (Peter Spoerri) from Zürich, Fruitmarket will produce Heidi Specognas („Cahier African“) new Documentary „CLAUDIA ANDUJAR - AN ENCOUNTER WITH MISS YANOMAMI“. Heidi Specogna, her DOP Johann Feindt and sound engineer Thomas Keller were in Brasil in September to further develop the project and do some preliminary shooting. In her film Heidi Specogna portrays the brazilian photographer Claudia Andujar and the indigenous people from the Amazone region she portrayed and supported throughout her life. The production is planned to start in 2019. Heidi’s last Documentary „Cahier African“ was a great success worldwide and was awarded with the German and the Swiss Film Academy Award. Fruitmarket received 40.000 Euros development money for Philipp Jedicke’s next theatrical documentary „VIENNA CALLING - LET’S GET RÄUDIG“ (working title) from the Film- und Medienstiftung NRW. The film portrays the new, young and highly successful scene of musicians and poets from Vienna like Voodoo Jürgens, Stefanie Sargnagel, Wanda, Bilderbuch and other unadjusted bizarr characters that fill up concert halls from Vienna to Hamburg. With a whole lot of unmistakable charm these artists embody the alternative to any self optimization madness, being hedonistic and nihilistic at the same time. Philipp Jedickes remarkable debut „Shut Up and Play the Piano“ on piano legend Chilly Gonzales“ is currently running in cinemas and at festivals very successfully . For "VIENNA CALLING“ Fruitmarket will coproduce with the viennese production company „AMOUR FOU“. Production start is planned for fall 2019. On the 25th of October, our documentary “Sunset Over Mullholland Drive” is celebrating its premiere at the 52nd Hof International Film Festival in Bavaria. Director Uli Gaulke dives into the world of „old Hollywood“. Just North of Los Angeles lies the Motion Picture & Television Fund, the retirement home of the US film industry. Former filmmakers such as actors, directors, screenwriters, editors, cinematographers, sound technicians, lighting technicians and make-up artists grow old there and continue living their passion for film. Producer Arne Birkenstock will be at the Screening on Thursday at the cinema Regina. Uli Gaulke, D.O.P Axel Schneppat and line producer Roopa Rao are off to India to meet the first of several one hundred years old Ladies, who have changed the world. For CENTURY OF WOMEN Uli Gaulke dives into the cosmos of five women whose centenary existence breathes life into a bygone era. He creates a monument for these women, contemplates the fundamental questions of life, such as the pursuit of happiness, self-fulfillment and love and uncovers the secrets of aging. Creative Europe’s Media program supports the development of three Fruitmarket productions with 120.400 Euros. Among the projects supported is „BEASTLY BEST FRIENDS“, a documentary series for children and „KIDS FIGHT“ by Sara Tareen and Tonje Hessen Schei, which we coproduce with Jonathan Borge Lie and Up North from Norway. The evaluation committee praised the "highly interesting projects“, which are "very convincing and suitable for the international market“. We also liked what they wrote about our company Fruitmarket: "The company proves that it is continuously trying to be innovative while at the same moment keeping a high quality of topics and artistic values." Our coproduction „DREAMAWAY“ by Johanna Domke and Marouan Omara will be running in competition at the prestigious BFI Film Festival in London (Oct., 10th to 21st). DREAMAWAY takes us to the surreal beaches of Egypt: It hasn’t been so very long since rich tourists from around the world came to stay in the luxury hotels of Sharm El Sheikh. But the Arab Spring and the confusion of the post revolutionary period quickly robbed the southern tip of the Sinai Peninsula of its charm as a go-to summer resort. Saturated with elements of surreal fiction, the documentary takes us to a shimmering city of ghosts to visit its last inhabitants – resort employees who feverishly dream among the abandoned hotel suites. DREAM AWAY is a coproduction of Monokel with Fruitmarket and Fig Leave Studios. The film had its world premier at the documentary competition of Karlovy Vary IFF. After its world premier at HotDocs Toronto and its German Premier at Dokfest München, its appearnces in Lima, Guanajuato IFF, Doqumenta and Monterrey FF, „MAMACITA" will come to the Los Angeles Filmfestival, the Margaret Mead Festival in New York, the Zürich Film Festival and the Hiroshima IFF. For the screenings in Los Angeles (Sept. 20 and 29th), Director José Pablo Estrada Torrescano will be present. In Zürich, producer Arne Birkenstock will be present for the screening on September, 27th and Director José Pablo will be there for the screening on Oct., 7th. MAMACITA is an extravagant Mexican beauty queen living in her own kingdom in company of her loyal servants: gardener, chauffeur, chef, housekeeper and nurses. 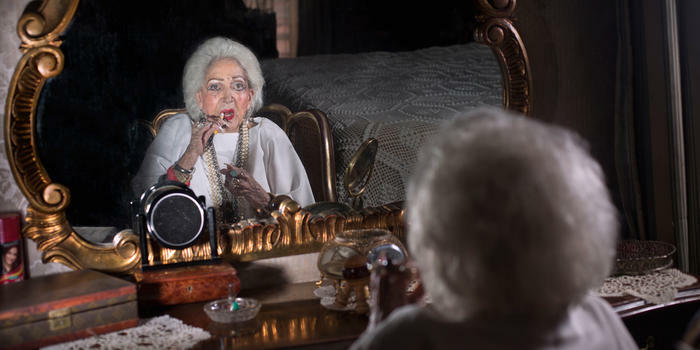 The 95-year-old lady has turned her house into a castle, hiding the open wounds of a prominent Mexican upper class family behind its stone walls. When José Pablo went abroad to study film, Mamacita made him promise to return to Mexico one day to make a film about her life. He conquers his granny’s empire like a Trojan horse, discovering the haunted spirits of his own past and the lack of love that his entire clan has suffered from for generations. MAMACITA is a coproduction with NoPal Pictures (Mexico), Antevita Films (Luxemburg) and Convois Studios (Germany). On the 1st of July "Dreamaway" celebrated its World premiere at the 53rd Karlovy Vary International Film Festival. Dreamaway tells stories of young hotel workers of the once so popular luxury resorts in Sharm El Sheikh. After the Arab Spring Egypt and especially the southern tip of Sinai Peninsula is no longer a go-to summer place, leaving behind big dreams in this desert landscape. In October Dreamaway will be part of the BFI Festival in London with two screenings! The film is also part of the Documentary competition at BFI. On Saturday the 28th of April, our documentary “The Night of All Nights” had its North American Premiere at the TIFF Bell Lightbox 2 in Toronto at the Canadian International Documentary Festival "Hot Docs". On the 11th of May our movie "Dreamaway" will have its World Premiere at the 53rd Karlovy Vary International Film Festival in the Czech Republic and is part of the international competition. On Monday the 30th of April, our documentary “Mamacita” had its World Premiere at the Scotiabank theatre in Toronto at the Canadian International Documentary Festival "Hot Docs". José Pablo Estrada Torrescano´s film about the life of his grandmother, Maria del Carmen Torrescano, kept the audience laughing and crying. The film is also part of the DOK.fest München in the section DOK.female, where the focus in 2018 centers women and their perceptions. Today, THE NIGHT OF ALL NIGHTS, has its official cinema release in Germany! 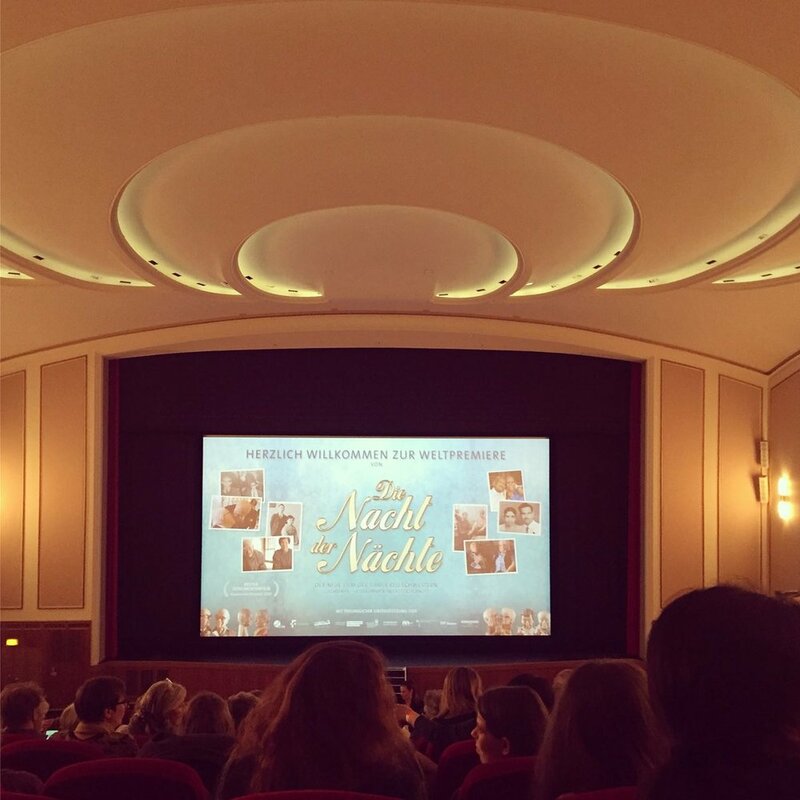 On the 28th of March, our documentary “The Night of all Nights” had its World Premiere at the historical cinema „Lichtburg“ in Essen. Accompanied by the german couple that is portrayed in the movie, the sisters Yasemin and Nesrin Samdereli, directors and authors of the film, enjoyed the night together with the crew, family and friends and a very responsive audience. The film has its official cinema release on the 5th of April in Germany! THE CONGO TRIBUNAL MOVES AROUND THE WORLD AND RETURNS FOR GOOD TO CONGO! Milo Rau’s spectacular reenactment project moves around the world. The film will be screened at numerous festivals like CPH:DOX, Movies that Matter, IRFF Lagos, and many more. The exhibition with VR-installation, interactive Webproject, Hearings and more moves on to the Stroom in The Hague, where it will be shown from march, 10th until april, 8th. But the most striking development of this project is, that lawyers, human right activists and journalists want to use the film as a model to establish real regional tribunals in the DR Congo in order to stop impunity and give room for truth and justice! The filmmakers support them and already raised 100.000 for a project, which is supported by SIMONETTA SOMMARUGA, Federal Councilor for Justice (CH), WOLFGANG KALECK, founder of the European Center for Constitutional and Human Rights (ECCHR) and jury member of the Congo Tribunal (GER), CHANTAL PEYER, Head of the “Business and Human Rights” department, bread for al (CH)l, R. NIKOLAUS BERGER, Judge at the Federal Supreme Court (GER) and many others. LET’S CREATE TWO, THREE, MANY CONGO TRIBUNALS! If you want to support us, please do so and join the campaign here! "THE CONGO TRIBUNAL" BECOMES AN INSTITUTION! "And with all the horrors shown in the film, it is important to me not to lose sight of hope. If ‘The Congo Tribunal' has proved one thing, it is that the truth can be found, no matter how complicated the connections are. And justice is possible, here and now. We just have to establish it." When Milo Rau realized the "Congo Tribunal" in Bukavu in 2015, the country was shocked: two ministers were dismissed, with its motto "Vérité et Justice" ("Truth and Justice"), the theatre tribunal became the hope for change in a region suffering from a civil war that had lasted for over 20 years. And when the epinomous documentary was presented to the Congolese population in the summer of 2017, the reactions were overwhelming: thousands of Congolese had come to see the film. "This film is the latest cry for help: Rise! What are you waiting for?" said a spectator to one of the accompanying journalists. For Denis Mukwege, winner of the Alternative Nobel Prize, director of the Pansi Hospital (Bukavu), it is a film "invaluable to our country." Now, the "Congo Tribunal" is the first art project ever to become an institution: Together with a group of Congolese and international lawyers, human rights activists and journalists (e. g. Sylvestre Bisimwa, Solange Lusiku, Jean-Louis Gilissen, Colette Braeckman, Harald Welzer, Wolfgang Kaleck), we are continuing the fight against impunity in the Democratic Republic of Congo, which began with Milo Rau's international touring film & installation "The Congo Tribunal". The aim is to set up and establish an institution in Eastern Congo that will deal with mass and economic crimes in the region using a series of local civil society tribunals along the lines of the "Congo Tribunal" (2015/2017). In order to support the planned tribunals financially, in terms of content, organisation and logistics, the association DOCTIVISM collects donations. This NGO was founded by Fruitmarket, Langfilm and the IIPM. The campaign "Let's Create Two, Three, Many Congo Tribunals" will officially be launched on March 9th at the Academy of Arts (Berlin) in the presence of the chief investigator Sylvestre Bisimwa, jury member Wolfgang Kaleck and director Milo Rau. The campaign is supported by numerous institutions and personalities, among them the Swiss secretary of justice, Mrs. Simonetta Sommaruga and the German federal Judge, Dr. Nikolaus Berger. On our information pages we explain what exactly happens with the donations and who is behind Doctivism - and we are looking forward to your support! Milo Rau’s documentary „THE CONGO TRIBUNAL“ will be screened at 68th International Film Festival Berlin. After being screened on Locarno, Leipzig, Solothurn and other festivals and after receiving the Zurich Film Award and being nominated twice for the Swiss Film Award, the film will be shown on February, 20th at 2pm and on February 21st at noon. Both screenings take place at the Delphi Lux Cinema (Kantstrasse 10, 10623 Berlin). On the 20th, producer Arne Birkenstock will be present for a Q&A after the screening. The film is part of the LOLA@Berlinale program, where all films are screened, which are preselected for the German film awards „Lola“. Access to the screenings for accreditated guest and members of the German Film Academy only. Another public screening will take place at the Babylon Berlin Cinema (Rosa Luxemburg Strasse 30, 10178 Berlin) on February 23rd. This screening is open to the public! There will also be public screening in Berlin will take place on March, 9th in the „Akademie der Künste“ (Academy of the arts) in Berlin, followed by a panel with Milo Rau (Director), Klaus Theweleit (Cultural theoretician), Fiston Mwanza Mujila (Author), Sylvestre Bisimwa (Head investigator, The Congo Tribunal ), Wolfgang Kaleck (ECCHR) and Dorothee Wenner (Curator). Last night Milo Raus film "The Kongo Tribunal" was nominated for the Swiss Film Award in Solothurn at the "Nominations Night" twice in the following categories: Best Documentary Film and Best Film Score from Marcel Vaid. Congratulations to whole team! The Swiss Film Award will be presented on the 23rd of March in Zurich.